Thank you for joining the Friends of Cedars of Lebanon State Park. Your membership dues and donations will be used to preserve and promote our beautiful state park. 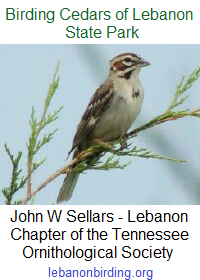 Someone from the Friends of Cedars of Lebanon State Park will be in contact with you soon with information about getting involved in the group. In addition, your email address has been added to the friends group newsletter roster. Also, expect to receive additional email messages from the group occasionally. Thanks again for joining the Friends of Cedars of Lebanon State Park. We look forward to seeing you in the park and at our next meeting. We are happy to be members of Friends . . . Blessings to you all who lead and serve.